Junie B. Jones is headed trick-or-treating.....and she is not happy about it! 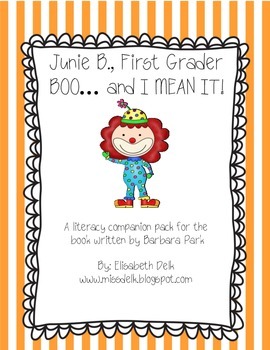 This is a literacy companion pack for the book Junie B., First Grader BOO...and I MEAN IT! by Barbara Park. In this pack you will find everything you need to create a book study booklet for this book. The booklet can be used whole group or in small groups. 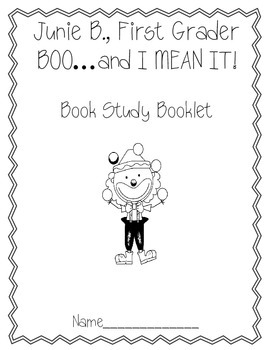 There is a book study booklet cover, vocabulary sheet, prediction sheet, 9 chapter summary sheets, 9 chapter comprehension question sheets, two venn diagrams, a text-to-self writing sheet, a opinion writing sheet, a story map, and a Junie B. character map. *Please note you will need the book Junie B., First Grader BOO...and I MEAN IT by Barbara Park in order to complete these sheets.